Location: On the street line. 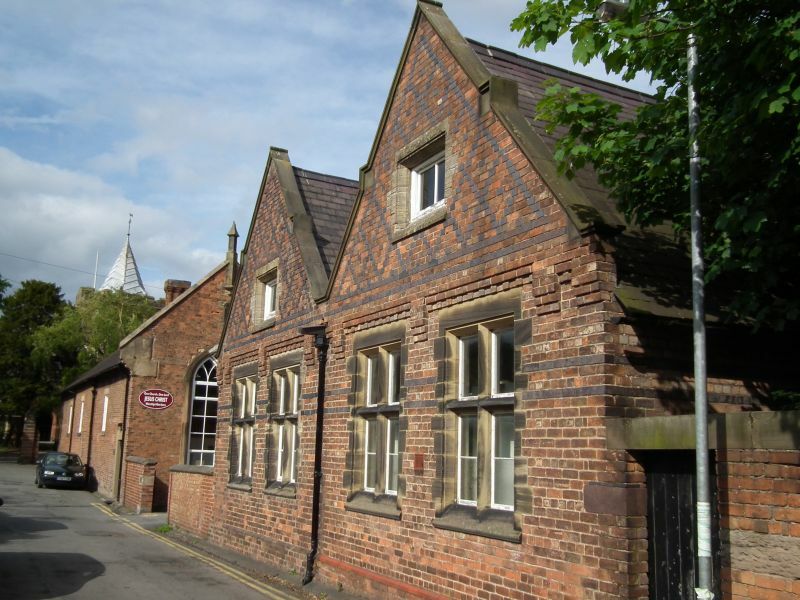 A one and a half storey double-pile building in neo-Elizabethan style, built in 1875 and in use as the village infants school until 1975, where after the church hall. Of red brick, under a steeply-pitched slate roof. Twin gables facing the street, with simply moulded stone copings and central projecting kneelers. Paired, chamfered stone cross windows to each gable, with sloping cills. Entrance to N via a large porch with steep gable, canted out to accomodate shallow-roofed flanking bays. Plain modern entrance and doors. Blocked ogee-headed entrance to E face. Recessed, 6-pane sash windows flanking porch. Cambered heads. Slightly oversailing and dentilated upper gables, the main street-facing ones with central, single-light, 2-pane windows. Diaper decoration in blue headers to gables with similar decorative banding. Plain brick plinth. Simple chimney with necking to rear of L gable. Listed for group value with the neighbouring Tithe Barn. At end of Church Lane, the walls bordering St. Dieniol's Library, Cross Tree Lane, and the Rectory gardens. On the corner at the junction of Glynne Way with Church Lane.